I V Gone defeating River Wind (#2) and Fate Cant Weight (#3) in the Adequan Will Rogers Derby Challenge on Sunday. CLAREMORE, OK�SEPTEMBER 29, 2013�I V Gone earned a starting position in the $200,000-Guaranteed Adequan Derby Challenge Championship(G2) at Los Alamitos Race Course on November 9 by winning the Adequan Will Rogers Derby Challenge Sunday afternoon. Danny Salisbury and Robbin Caldwell's I V Gone bounced off a third place trial effort to return and defeat River Wind by a neck in the $41,130 Adequan Will Rogers Derby Challenge. Fate Cant Wait finished half-a-length back in the third. Tana Caldwell conditions the IVORY JAMES gelding out of Bye Bye Bygones, by Takin On The Cash. 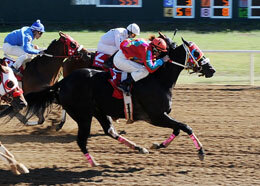 Bred in Oklahoma by L.P. Frank, the black gelding has a combined record of 4-2-1 in 14 starts and has earned $50,261. The lightly raced River Wind picked up $8,226 for owner/breed Joe Williams. Mollie Devereaux saddled the gelding. Alex Baldillez, Jr. had the riding call. Eddie D. Willis saddled Reliance Ranches, LLC's Fate Cant Weight. Jimmy Brooks rode the filly. Bred in California by Double Bar S Ranch, LLC, she earned $4,113. Hiclass Fly, Jess A Sign, Jazz Wagon Painted Josy, I Sai Ahh, Bulletsinthegun and Cockedandlocked completed the field.